Good drilling practices alone won’t save wells experiencing collapse issues, but creating accurate Geomechanics models, and continuously upgrading those models, will. Regardless of where in the world a client’s drilling operations are, it is critical to design a drilling program that matches the rock. That’s seems pretty simple, but the truth of it is, it is not uncommon for some operators to plan their drill sites solely off of topography, and not off of downhole rock mechanics. That is not an indictment of the drilling team – in many cases, they get handed the location and are forced to begin planning wells before the geomechanics studies are even complete, and by the time they are, they are so far down the road with AFE’s and site plans and even roads, they really can’t back out and move the pad two miles in the opposite direction. They are forced to drill at whatever angle and azimuth will hit the target. Here’s an example. A client of ours bought a project that had been started by another company. There is an existing pad from which to drill from, and all of the wells drilled so far have been to the NE. Pretty good wells, some issues, but nothing that couldn’t be worked through. The problem came when the wells to the NW hit the schedule – BHA after BHA, left in the ground… Why? Because that direction, and the angles needed to cover that part of the field, required significantly more mw and different designs than the wells to the NE. It became obvious, right from the start, that “good drilling practices” alone won’t save wells experiencing collapse issues, but creating accurate Geomechanics models, and continuously upgrading those models, will. 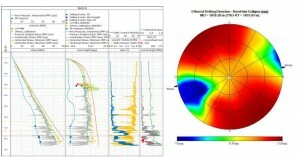 Redesign of the pattern of wells to be drilled from a given platform. Maybe simply drilling 45 degrees off, and then turning them in the target zone will save millions in potential NPT? 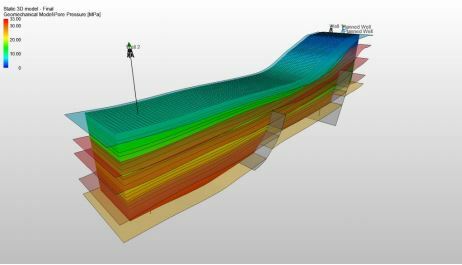 A solid 3D model showing the various fault blocks will allow us to not only plan casing points but also to ensure no oil is being stranded. Important to note that, as unfortunate as it may be, to ensure success, we may have to specialize well designs; some may need 4 strings, some may need 5, depending on whether or not we have to cross fault blocks with significant stress changes in the same section. For example, say we are accustomed to drilling a 12.25” section through a certain formation for 15000’. That may be possible within a fault block; if we cross from one that is primarily normal-fault regime into one that is strike-slip or possibly thrust-fault regime, a 3D model will allow us to know that, and plan for it accordingly. Outputs from the 3D model along the proposed wellpath will easily and accurately define PP/CP/FP and MW window needed. Will also allow for constraints to be put upon wellpath inc/azi. HXR has found that, even between different departments, let alone other companies, clients spend a significant amount of time “reinventing the wheel”. Lessons Learned, whether it be Geo or ERD, are not communicated well across the individual departments tasked with coming up with a well plan. A 3D model allows for wells drilled into a previously untapped area to benefit from the information accumulated from all of the other wells nearby. And do it graphically, where there is no misunderstanding. Having one centralized model can save millions in time and individual modeling costs. Having one model has the added benefit of allowing all involved to collaborate and build upon the single model, instead of building their own partial models which will inherently be more inaccurate, since not all of the wells drilled will be part of it. HXR can help your team build, and maintain, those models. Easier to know what type of a logging program is needed in a certain area of the field.